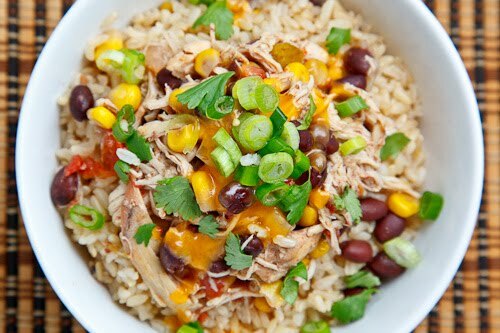 Chicken santa fe cooked in a crockpot for a quick and easy meal that is full of flavour. Since one of my goals of experimenting with crockpot cooking was to save a bit of time, I decided to test the recipe out on a busy weekday where I could get everything into the slow cooker in the morning before leaving for work. However, I could not resist spending a few minutes in the morning caramelizing the onions and chicken just a bit before transferring them to the slow cooker to add a bit of flavour even though you could easily skip that part and just throw everything into the slow cooker. 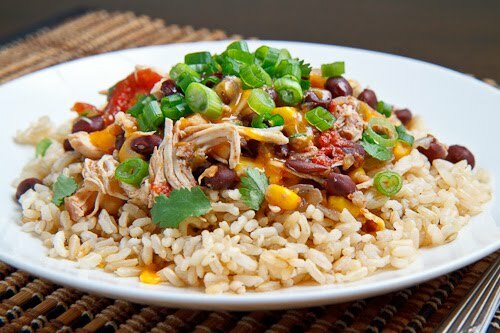 I was hoping that things would be quick and easy and it was just as simple as putting everything into the crock pot in the morning and pulling the chicken out at night to shred before serving! The most amazing part was when I got home from work and opened the door to the aroma of a fully cooked meal and when it hit me and I knew that I would be eating a tasty meal that night with only of five minutes of work ahead. Add the onions and saute until tender and a bit caramelized, about 4-6 minutes. Add the chicken and cook until browned on both sides, about 3-4 minutes per side and set aside. 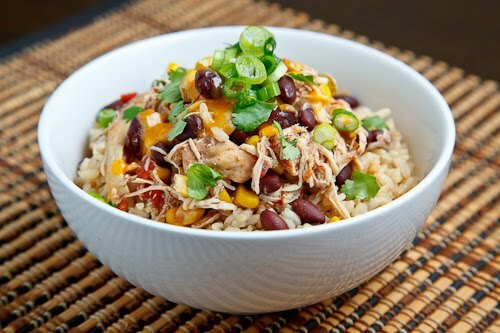 Add the diced tomatoes, black beans, corn, cayenne, salt and pepper to the crockpot, stir, add the chicken and cook on low heat for 8 hours. Remove the chicken, shred it and return to pot. Serve over steamed rice, garnished with green onions and cilantro. this sounds yummy!! Thanks again for your delicious recipes!! LOVE using the crockpot – thanks for the great recipe! Delicious looking! A great dish for cold winter days. Me encantan estos platos, perfectos. My biggest pet peeve about crockpot dishes is that they're usually so…ugly. But yours is gorgeous! Both in taste and in aesthetics. Looks wonderful–and I can't usually say that about slow cooker recipes. I bet that your time caramelizing the onions was a big boost to the dish. Thanks for sharing the recipe. I just found your blog via Pinterest, and darlin, I don't know whether I should cry or come to Canada and hug you! Your recipes all look amazing and I will no longer have to worry about what to make for dinner. I have made this meal from Skinny Taste as well and it is one of my favorites. It reminds me of the burrito bowls at Chipotle, but in the comfort of my own home! Yum! This looks delicious!! I cannot wait to try this. I love slow cooker recipes! This looks great. Some healthy food is in order after all of those excess Christmas calories!! Doesn't the chicken breast get dry? I bet this would also be good with turkey thighs, which are great for this kind of dish. Kevin, you hit an important point for people using crockpots. While it's true you *can* just throw everything into the pot and walk away with little advance, prep, this results in decidely lackluster dishes with not much aesthetic appeal and very often, decreased flavor. Crock pot are an efficient time-saving tool and "natural meat tenderizer — but they are not miracle workers. Consider it no different than a casserole dish which simply takes longer than average. If you use onions, caramelize them,as you did. If you use chicken, brown it first to bring out the sugars. For every step you take to prep your meal as you would if you were NOT using a crockpot — you'll be thrice rewarded. While it's true it isn't always possible to take those few extra steps, whenever you can, it's well worth it. So glad you liked it Kevin! This has been so popular on my blog for years! Your photo looks lovely! Anonymous: The chicken was so moist! I specifically remember noticing that as i shredded it even though I was not really looking for it. I have to do a quick browning too, you can't get the Maillard reaction in a crock pot. Great looking dish, Kevin. Stunning photography as always. I know you get tired of hearing that, right? Really, really yummy! I had some avocado and sour cream so added them on top. I also made it in a large pot on the stove top since I don't have a crock pot and why dirty two pots when you can just use one? I'll be making this one again. Thanks so ,much. I made this last night and it was delicious. I threw in a can of diced green chilies and added some avocado chunks with the scallions. I will definately make this often. Thanks for the recipe. Yummy! Depending on your crockpot, you can turn the heat way up and do your browning/caramelizing right there, then add the remaining ingredients. No second pan to wash! OMG I'm always looking for an original crock pot recipe–it's so lovely to come home at the end of the day and kick back with a beer while I dish pre-cooked food from my little 1970's crockpot with one slightly melted leg. I can't wait to give this a shot. THank you!! I made this for a family dinner–it was amazing. Glad to add another crock pot recipe to my favorites. Bonus that it is made with ingredients that I keep in my pantry/freezer. Yummy. Cindy: Glad you enjoyed it!